Here's the thing about Mrs. Claus: she gets things done. Sure, Santa delivers the presents, he's the one climbing down the chimney, getting all the glory, but come on. You think he can pull all that off alone? Let us ask you this? Do you have any idea how hard it is to keep nine reindeer fed and stabled and fit 364 days a year? Let's not even get into the details on cleaning up after them. Elves help with that? Yeah right! The elves are strictly workshop elves ever since they unionized. So there goes Mrs. Claus, making sure the ship sails smoothly. And speaking of elves, do you think it's easy corralling and organizing hundreds of workers throughout the year, keeping track of schedules and assignments, ensuring proper lunch breaks and that all OSHA guidelines are met? It's a massive job. But there she is, day after day, making sure the trains run on time. Santa is why Christmas is delightful for you and I. Mrs. Claus, on the other hand, is why Christmas has always been on December 25th, never pushed back due to production delays, logistics problems, or sick or missing reindeer. You really think Santa is checking his list twice? Mrs. Claus is not only checking it, she's correcting all the grammatical errors and spelling mistakes. 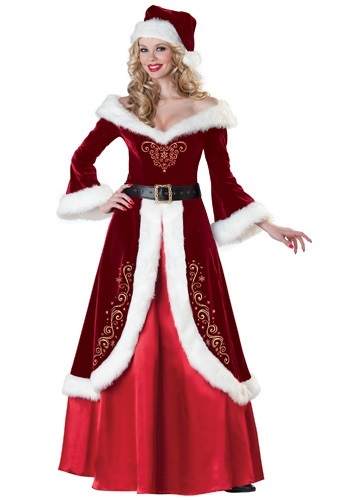 Mrs. Claus isn't a Mrs. at all. She's a freaking queen. Queen Claus, making sure every Christmas is as wonderful and joyous as it should be. Put on this costume and show people what a true queen is: capable, fierce, and powerful. Queen Claus.